In my last post, I talked about using Task Based Language Teaching in Business English. 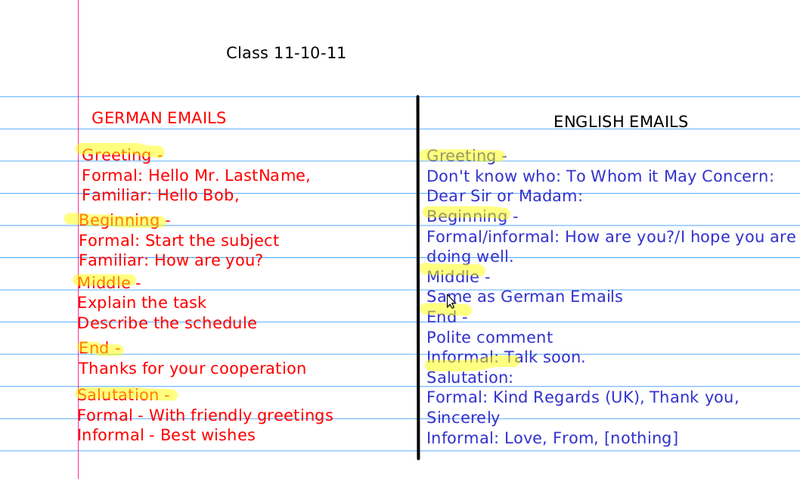 Today, I want to share with you an example of a lesson I did with my German students of Business English (level B1). The lesson was about emailing. How are they written? What is the format? What common phrases do you use? What are the greetings? etc. What is good etiquette? What is polite? What is rude? The idea here is to elicit key vocabulary about emails, including (but not limited to): Greeting, Introduction, Body, Conclusion, Salutation, Sender, Recipient, Reply, etc., as well as the translation of their common forms for these items. During the discussion, I wrote the information and the terms on one side of a digital note sheet that was projected onto the wall. I gave each group several (at least 3) of the emails. 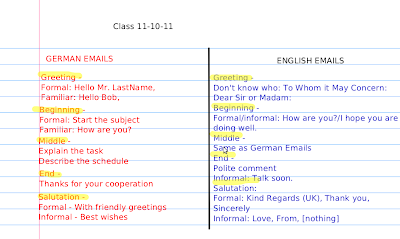 Their task was to identify phrases, formats, or things that are different in the English emails than in the German Emails. It's a good idea to make sure that they used English in the group work, because it seems natural to revert to the NL when tasks are information based rather than linguistic based. The students wrote on the emails, underlining and circling items that they found. As we discussed the emails, and I wrote the information on the other side of the note sheet (for comparison with the German). I also had them arrange the emails from the ones that they thought were the most formal to the ones they thought were the least formal, and then to explain their choices. After the discussion, we watched 2 YouTube videos that I had chosen. Both were intended for native English speakers (i.e., they weren't English teaching videos). This is important to me because I want the students to get a feel for what real English sounds like, not just what teacher language sounds like. The first video was a email guide, probably for people who didn't know how to use email at all. My students are proficient in email, but the task here was for them to write down new words, interesting ideas, or things that they learned. It would be better to have some more focused questions for the discussion, but I didn't. During the video, I paused to let them discuss and write down notes. I also skipped a big chunk in the middle about revising emails because it was really boring and not relevant. We discussed their responses at the end of this video. The second video was about email etiquette. It was shorter and funnier, and the person in the video also spoke a lot faster. After, we talked about the questions they had (i.e., “What is Snail Mail?”), and then about the interesting content. They didn't remember some of the content, but when I mentioned how I learned something from the video, too, it reminded them and sparked a little more conversation. The linguistic focus for the lesson was a review of the uses of the various present tenses (simple present, present progressive, present perfect) but we also ended up reviewing the simple past. The rationale behind this choice is that, not only do the tenses need to be reviewed, but that emails generally feature a lot of these tenses. This section didn't connect as well as another grammar point could have, but you have to work with your students' specific needs. I wrote the three present tense forms (I work, I am working, I have worked) on the board and at the beginning, I mentioned their technical grammar tense names once in the beginning, but after that, I focused on their use. We discussed by comparing two forms at a time (i.e., what is the difference between “I work” and “I am working”). After that, we did a go-around-the-room exercise conjugating different verbs for different circumstances. I split the class into two groups, and each group got a prompt. Prompt 1: You work at company that makes advertisements. You want to make an advertisement for a big toy company. Email the marketing director (you don't know his name) and see if he is interested in working with your company. Prompt 2: Yesterday, there was a meeting in your company. You went to the meeting, but you are a little confused. You have some questions about what happened in the meeting. Email your co-worker (the meeting leader) to ask for more information. Each group wrote an email based on the prompt. I gave them about 5-10 minutes, and then they “emailed” their paper to the other team. The other team then responded to the “email”. I saw that they were a little confused in the response, so I also had them switch prompts so that they knew why the original email was written. This activity probably needs more time and it also needs very simple prompts. The last step was homework for the week. I split the group into partners, and I handed each person an A or B task, and then briefly explained what was going to happen. Basically, there must be at least 4 emails total (2 from each person). 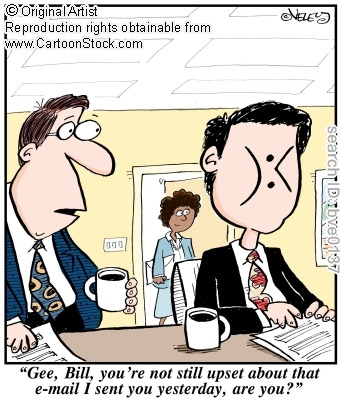 Person A must initiate a meeting, person B must reply and ask for a copy of the meeting agenda. The students are supposed to print out the entire email chain and then we will review them in class next week. Person A: - Initiate a Meeting. Try to find a a time, date, and place. Provide any information that the other person needs. Person B: Wait for the email from Person A. Agree on a good meeting time and place. Also, ask for the meeting agenda. Person C: Wait for person A and Person B to email you. You can't meet on the day that they suggest, but you are free almost every other day. I hope you like the lesson. My students told me that they enjoyed it because it was so "interactive." Feel free to use or modify it, and let me know if you have any questions!